Animals can make superb centres of interest in a composition whether they are wild or domestic. Like the landscape itself, if you include animals they do benefit enormously from good lighting conditions. I take every opportunity to sketch and photograph animals not only in good positions, but when they are bathed in good lighting or atmosphere. In that way I build up a reservoir of various features – not just animals – that can be added into a composition where I feel it is needed. 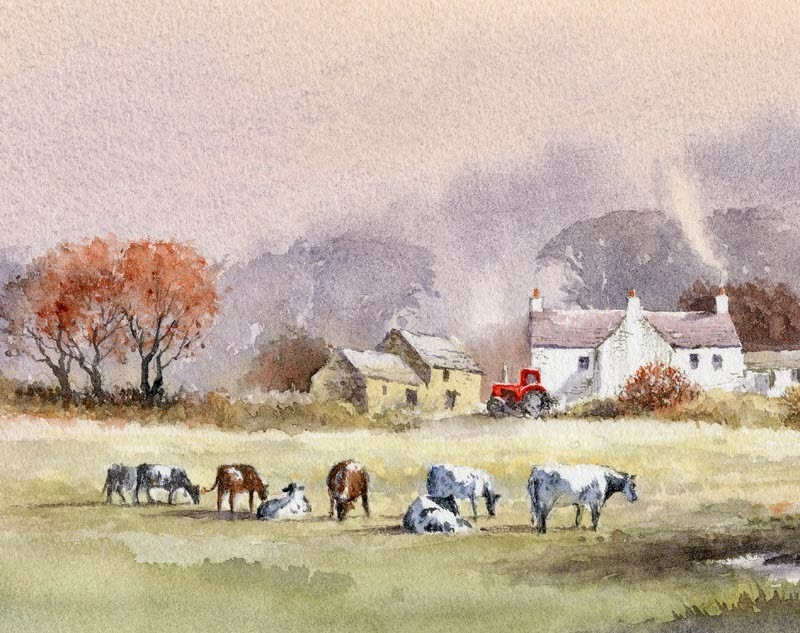 The illustration shows part of a watercolour in which the cows were added from another scene. The whites on the animals are important in suggesting light, and these have been achieved by leaving the paper white, as with the house. After all the markings on the animals had been rendered and allowed to dry I applied the shadows with a mixture of French ultramarine with a touch of cadmium red. Painting this in after the markings tends to soften the effect. Note the underbelly of the right-hand cow has a slight touch of Naples yellow placed while it was still wet, to suggest reflected light bouncing back up off the ground. As well as appearing in my latest book, Winter Landscapes in Watercolour, this painting is one of several that I’ve just delivered to the Erwood Station Craft Centre in the beautiful upper Wye Valley about six miles south of Builth Wells. It’s a delightful spot to stop for refreshments and check out the crafts. At the moment there are some lovely wool products and pottery to tempt you, and with Christmas coming it’s a great place to get those special gifts that can be so difficult to find. They also stock all my books. For further information give them a ring on 01982 560674 It’s quite likely that you’ll also spot the odd cow around, so don’t forget to bring along your sketchbook. This entry was posted in Animals in landscape painting, David Bellamy by David Bellamy. Bookmark the permalink.